President Donald Trump reportedly took a swipe at the late Senator John McCain (R-AZ) hours before his State of the Union address on Tuesday, and Meghan McCain was having none of it. According to Peter Baker of the New York Times, Trump still resents McCain for voting against a repeal of the Affordable Care Act. McCain famously killed the bill with a dramatic thumb-down gesture on the floor of the Senate. On Tuesday, Trump jabbed at McCain’s book, The Restless Wave. “By the way,” Trump said of McCain, “he wrote a book and the book bombed.” In reality, McCain’s book earned the number two spot on Amazon and was Barnes & Noble’s third-best seller. McCain’s eldest daughter Meghan blasted Trump’s “obsession” with her father on Twitter Tuesday afternoon. Ms. McCain also called out Trump’s hypocritical call for “unity” as he bashes her father. The former Senator and Vietnam War veteran included some harsh criticism of Trump in his book. 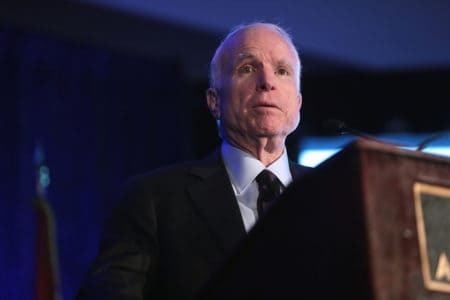 McCain died on August 25, 2018 after battling brain cancer. He was 81.